"Recent years have seen a growing interest in creative and informal urbanisms of a wide variety.... One of the best is Villages in the City edited by Stefan Al... a fabulous piece of architecture and design graphica... The book succeeds by investigating and advocating for the informal without fetishizing it." "A relevant and valuable contribution to understanding the special problems posed by urban villages in the Pearl River Delta"
"A meticulous record of the villages with essays and beautiful images..."
"Villages in the City is a great book to learn about modern city development in China. It offers a lot of new perspectives regarding the phenomenon of urban villages, their rise and demolition, as well as the special role they play for migrants trying to cut their teeth in the city." "How do we make sense of China's urbanization, given its scale and its seeming chaos? Architect and professor Stefan Al has come out with two volumes that help sort out Southern China's project of modernization and development, both its factory complexes and its urban villages. Both works go inside the areas they study, and are generously illustrated with photographs, drawings and maps. 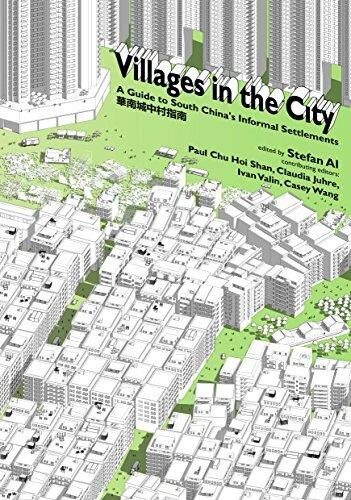 Villages in the City, the more recent of the two volumes and a companion to Factory Towns of South China, documents the peculiar phenomenon of what are nominally farming villages now surrounded by high-rises." "This book is an important and up-to-date record of China's urban villages... the villagers have managed to bypass planning and construction codes and rebuilt their villages into high-density neighborhoods that are housing millions of migrants in the cities... The spatial characteristics of these urban settlements have been understudied. This book will therefore be an invaluable addition to the existing research on China's distinctive trajectory of urbanization." Countless Chinese villages have been engulfed by cities. They no longer consist of the picturesque farms of rural China, but of high-rises so close to another that they create dark claustrophobic alleys – jammed with dripping air-conditioning units, hanging clothes, caged balconies and bundles of buzzing electrical wires – crowned with a small strip of daylight, called by locals “thin line sky.” At times, buildings stand so close to another that they are dubbed “kissing buildings” or “handshake houses” – you can literally reach out from one building to reach over and shake hands with your neighbor. Villages in the City argues for the value of urban villages as places. Although it is easy to misperceive these villages as slums, a closer look reveals that they offer an important, affordable, and well-located entry point for migrants into the city. They also offer a vital mixed-use, spatially diverse and pedestrian alternative to the prevailing car-oriented monotonous modernist-planning paradigm in China. Yet, most of them are on the brink of destruction, affecting the homes of millions of people and permanently eradicating a unique urban fabric. Contributors include Margret Crawford and Wu Jiong, Marco Cenzatti, Jiang Jun, Nick Smith, and Laurence Liauw.